Acute angle: An acute angle is less than 90°. Think “a-cute little angle.” Acute angles are kind of like an alligator’s mouth — not opened very wide. Right angle: A right angle is a 90° angle. Right angles should be familiar to you from the corners of picture frames, tabletops, boxes, and books, the intersections of most roads, and all kinds of other things that show up in everyday life. The lines that make up the sides of a right angle are perpendicular. Straight angle: A straight angle has a measure of 180°; it looks just like a line with a point on it (seems kinda weird for an angle, but there you are!). 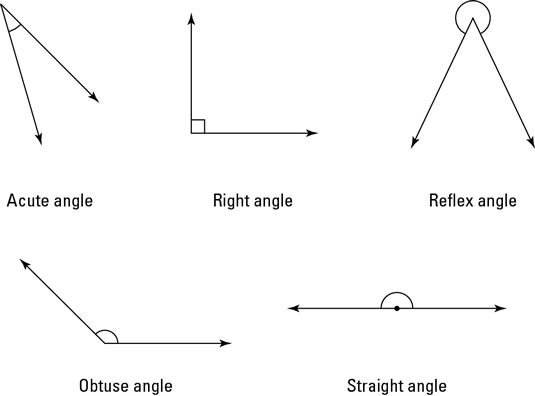 Reflex angle: A reflex angle has a measure of more than 180°. Basically, a reflex angle is just the other side of an ordinary angle. For example, consider one of the angles in a triangle. Picture the large angle on the outside of the triangle that wraps around the corner — that’s what a reflex angle is.